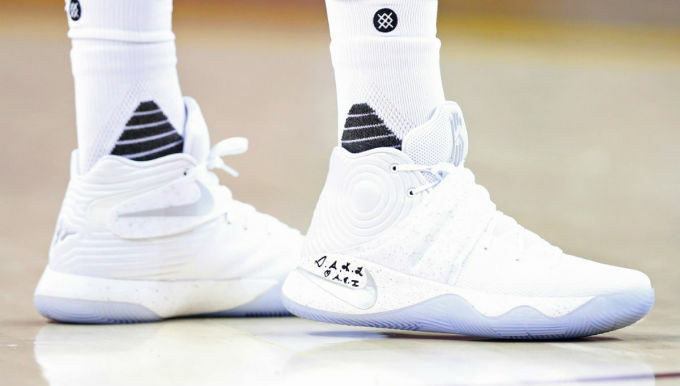 When the Cleveland Cavaliers hosted the Philadelphia 76ers for a preseason game Saturday night, Kyrie Irving debuted a new colorway of his signature shoe. Arguably the cleanest pair to date, the "Silver Speckle" Nike Kyrie 2 features a mostly white upper, with metallic silver speckles along the cross-strap and midsole. The colorway colorway is expected to hit retail sometime this month. Irving finished with 15 points, 2 rebounds and 3 assists in the Cavs&apos; 108-105 victory over Philly.